Edited by: Gudrun Miehe, Abdilatif Abdalla, Mohamed H. Abdulaziz, Zeina Al-Bakary, Angelica Baschiera, Ahmad Bhalo, Clarissa Dittemer, Ahmed Nabahany, Yahya Omar, Farouk Topan. Series edited by: Gudrun Miehe, Hilke Meyer-Bahlburg. 8 pp. Roman, 230 pp. 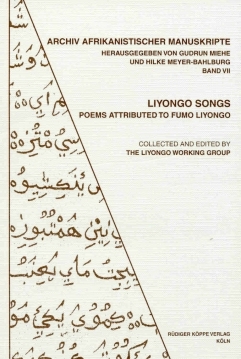 The present volume contains a collection of texts that – according to the Swahili tradition – are attributed to Fumo Liyongo, the legendary hero and bard. Liyongo is one of the most impressive personalities in the oral and literary tradition of the Swahili Coast. However his historicity has been the topic of many discussions. Nevertheless, the legends of him have become an integral part of the national heritage in this particular region. The oral and written traditions related to Fumo Liyongo fall into several different categories: a prose text, three longer poems in different metres, and several songs mainly praise or dance songs. The latter form the core of this edition. Nobody knows how far back the oral tradition of the songs presented goes, yet in almost all cases one or more written sources in Arabic script exist. Aiming at a pragmatic solution, this publication presents the canon of the songs in two parts. The first, Part A, contains the reconstructed texts as coming nearest to an assumed archetypal version. The Swahili text is provided with footnotes that explain northern or archaic language forms in Standard Swahili. The English translation follows the lines of the Swahili texts. The second part fulfils the academic needs of a critical edition of the songs. Here, the Swahili versions found in the sources are provided line by line. The appendix added to the main part of the book is meant to provide additional information on other important Liyongo texts and completes the collection. The presented book is the result of two three-week workshops at Bayreuth University in 2003/2004. During that program the Liyongo Working Group was founded, consisting of local experts on Swahili traditions and academic scholars of Swahili from Kenya, London and Germany. This collection and critical text analysis will be a welcomed completion of the actual documentation of Swahili literature and of interest to Africanists and Linguists in general. Under pdf-documents you will find the contents of the edition ans some specimen pages. The edition is an excellent prove of a possible and successful cooperation of various leading scholars in Swahili linguistics, literature, and poetry with local experts on Swahili tradition. [...] The Liyongo Working Group has achieved the great and difficult task to preserve a very important piece of Swahili cultural heritage and make it accessible.